Be empowered. Be connected. Be Bosnia and Herzegovina. 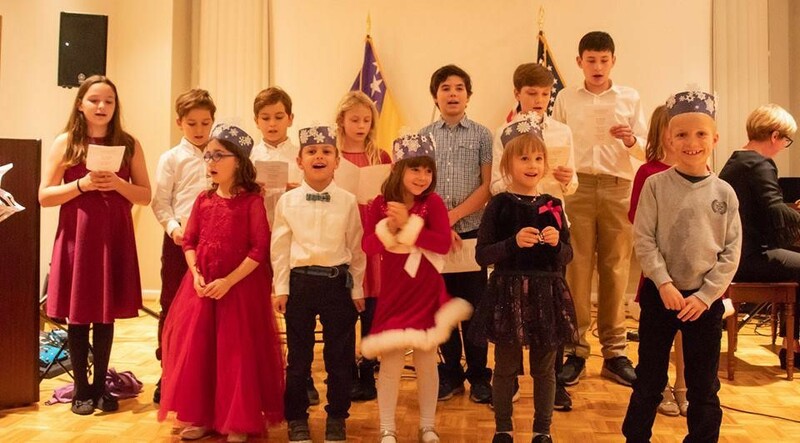 The holiday event organized by our School of Language and Cultural Heritage at the Embassy of Bosnia and Herzegovina last December was a great success! Congratulations to both the youth and adult performers who took part in the celebration and contributed to everyone’s good time and holiday cheer. This well-attended event raised almost $3,300 for our school. Thank you so much for participating and supporting our program! Our school made much progress in 2018. Last semester, we had 22 students, aged 4 to 12, divided into three groups according to their age and level of knowledge. As was very clear at our holiday event, we are extremely proud of our school’s diversity. Our students include not only children of the Bosnian-Herzegovinian diaspora, but also members of Croatian, Serbian, Montenegrin diaspora, American-Russian children, and others. As one of our teachers put it: “We are not only a Bosnian-Herzegovinian melting pot–we are an international melting pot!” And we welcome all! The school’s curriculum reflects our inclusiveness and is based on the cultural and linguistic richness of both Bosnia and Herzegovina, and its neighboring countries. 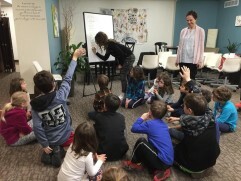 In addition to classroom learning, we are also committed to nurturing connections among people in our community. Thus we enriched last year’s program with various extracurricular events such as concerts, picnics, field trips, and holiday parties, and plan to further strengthen the program in the coming year. These are the happy faces of the seven Roma girls from the village of Ruzica near Bihac, Bosnia and Herzegovina who received assistance to attend school through BHeart’s “Get the Heck to School” project in 2018. Selma Selman has been instrumental in bringing our attention to Ruzica’s disadvantaged youth. Having just completed her master’s degree at Syracuse University, Selman is just one example of how an investment in a girl’s education exponentially increases her chances of escaping poverty. Not only has Selman eclipsed the limiting circumstances of her own childhood, she is now fighting to help younger girls in her village do the same. We were very proud to partner with Selman on this project. With your generous support, BHeart raised almost $10,000 during the winter 2017-2018 to help seven, carefully-selected girls who, we hope, will follow in Selman’s footsteps. With Selman serving as their mentor, we provided each girl a scholarship to pay for school supplies, materials and food, while giving special awards to those who made significant academic progress. Throughout the year, we were also able to provide school lunches to over 40 children in the Ruzica Roma community, both girls and boys. These lunches incentivize the parents to allow their children to continue attending school because school lunches are often unaffordable, and one of the reasons parents discontinue their children’s education. According to a very positive December report provided by the NGO “Alfa,” our local partner leading the project’s implementation, the seven girls–Esma, Indira, Medina, Mirzeta, Romana, Sandra and Senada–have made great progress, and are very motivated to complete the school year. They attended school regularly, improved their grades and have been empowered to imagine themselves as teachers, artists, nurses and fashion designers. They now dare to dream of attending and completing university studies. As most of them come from families with parents who have not even finished primary education, these are immense and powerful dreams! Thank you for enabling us to help at least one small segment of Europe’s most vulnerable and discriminated minority. By meeting the basic needs of the Roma students and their families through our “Get the Heck to School” project, we have inspired the entire village to become more open to the possibilities of education. The parents and children of Ruzica express their gratitude for your help and support, and send their warmest regards and best wishes! We would also like to thank you for supporting several of our fundraising efforts implemented through Facebook in the final months of 2018. Your willingness to help proved that you appreciate the work and goals of our small volunteer organization whose members are passionate, committed and selfless with their time when it involves BHeart projects. We hope to have your continued support in 2019 so we could improve and expand our activities.